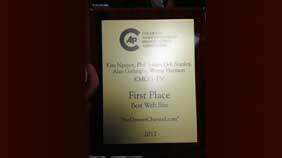 The Colorado Associated Press Broadcasters Association has humbled my coworkers and I with a new accolade! They’ve named TheDenverChannel.com the best web site (Two words?) of 2012. We’re honored by this award and I’m particularly proud because the site was rebuilt from scratch in September, right after I joined the team. It’s been a resounding success and I’ve learned so much from the experience.